Epson to Showcase Color Label Printing Solutions at Natural Products Expo West | Industry Analysts, Inc.
What: During Natural Products Expo West, Epson will be featuring its ColorWorks on-demand, desktop inkjet label printer solutions that deliver fast, efficient, custom food and beverage and natural products labels on-demand to save time and reduce costs, bringing greater flexibility to co-packing operations. The booth will also have samples printed from Epson’s SurePress digital label and flexible packaging presses, including real-world samples from Body Barrier™, a high-end soap and body wash brand. ColorWorks C3500 – With speeds up to four inches per second1, the C3500 inkjet label printer can produce up to 2,000 high-quality full color labels per day at a lower entry price point, helping to reduce labels costs and increase operational efficiencies. ColorWorks C7500GE – Built for reliable, high-quality performance, the C7500GE offers advanced on-demand, durable, full-color glossy and customized label printing with spot color matching at a low cost per label in a quick turnaround time for demanding, high-volume environments. 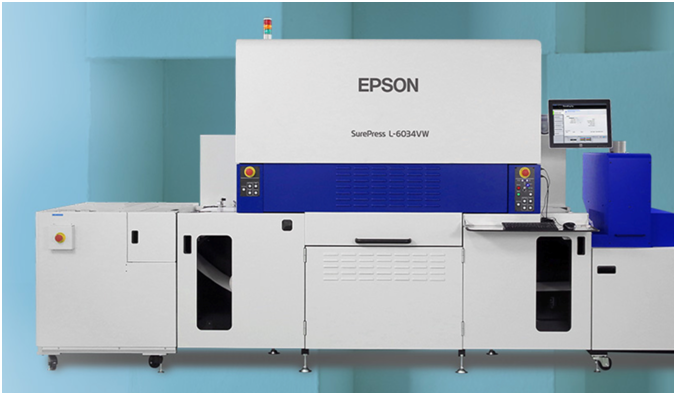 SurePress L-6034VW – Epson’s single-pass industrial press uses Epson’s PrecisionCore® linehead technology and low migration LED UV curing ink, enabling high-speed printing ideal for producing labels designed for scratch and weather resistance. The L-6034VW integrates functions required for label production, including a Corona Treater, White ink, digital varnish, an additional UV curing unit, and automated maintenance and print head monitoring. SurePress L-4533AW – This seven-color digital label press with White ink delivers remarkable color gamut for accurate spot colors and gradients for brand-quality color prime labels and packaging. The L-4533AW is a low-cost, turnkey solution. At the booth, Epson will be showcasing expanded packaging applications using water-based ink, including shrink and in-mold label, flexible packaging and thin film for foods. Thursday, March 7 – 10 a.m. to 6 p.m.
Friday, March 8 – 10 a.m. to 6 p.m.
Saturday, March 9 – 10 a.m. to 4 p.m.
Why: Developed by one of the largest label printer manufacturers in the labeling and packaging industry, Epson’s ColorWorks on-demand inkjet label printers and SurePress digital label presses provide proven results for a wide range of full-color labeling applications. Epson’s color label printing solutions are ideal for co-packers in the food and beverage industry looking to provide labeling and flexible packaging services for customers with a low total cost of ownership while offering fast-drying and durable food labels. For additional information, visit www.epson.com/label-printers. 1 When printing 2.2-inches (56mm) width bidirectional mode, with banding reduction disabled in 360×360 dpi resolution. Note: EPSON, ColorWorks, PrecisionCore, and SurePress are registered trademarks and EPSON Exceed Your Vision is a registered logomark of Seiko Epson Corporation. All other product brand names are trademarks and/or registered trademarks of their respective companies. Epson disclaims any and all rights in these marks. Copyright 2019 Epson America, Inc. This entry was posted in Epson and tagged ColorWorks, Epson, Label Printing Solutions, Natural Products Expo West, SurePress by IA Staff. Bookmark the permalink. Next → Next post: What Do You Get When You Combine Advanced Power Protection with Analytical Software? The Next Gen PCS!